Prenatal Vitamins 101: When To Start, What To Look For, & More! Prenatal Vitamins 101: When To Start, What To Look For, & More! If you are considering a baby in the near future, currently trying to conceive, or newly pregnant, prenatal vitamins are probably on your mind. Your midwife or doctor will most likely steer you in the right direction as to which brand to take, but you should still be aware of what ingredients to look for in a prenatal and exactly when you should start taking them. We dive a bit deeper to answer your questions about this simple, yet important, step in you and your baby’s life. Many experts will say that a woman should start taking prenatal vitamins as soon as she gets her period. To me, this is a bit extreme—can you imagine your teenage self being convinced to take vitamins that help with pregnancy?! Instead, it’s probably best to start taking them as soon as you decide you want to start trying to conceive. If you see your gynecologist to remove or get off your birth control or check on your overall health for conceiving, they will probably tell you to start taking a good prenatal vitamin. If a baby is in your future, but still far off, try to start taking them at least three months before you begin trying. Also if you are already trying or newly pregnant, start taking prenatal vitamins as soon as you can. 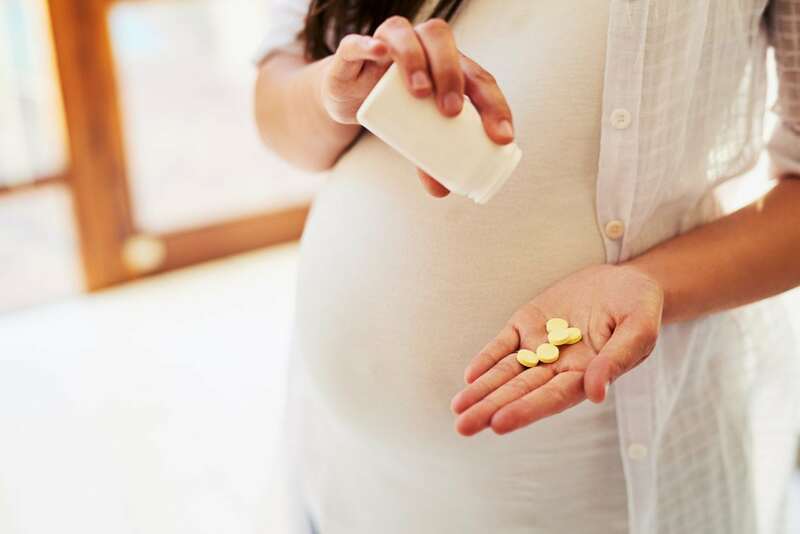 There are no downsides to taking prenatal vitamins early, but not taking them at all can cause problems down the line for your pregnancy and the health of your baby. You should also make sure that the vitamin doesn’t have too much Vitamin A or D and a good amount of Vitamin C.
It’s important that you find a vitamin with folate instead of folic acid. Most people know that this nutrient is essential for baby’s neural tube development and preventing spina bifida. Although research suggests that only bioavailable folate is beneficial, not synthetic folic acid. Most vitamin brands are making the switch. Speaking of bioavailability–look for a food-based prenatal vitamin. These supplements will be made from food instead of from synthetic nutrients. Since our bodies are used to digesting food, the vitamins and minerals in a food-based supplement will be more readily assimilated into your body. They may be a little more expensive, but you won’t be peeing out all the good stuff! There are also options for vegetarians, gluten-free women, and more. So do your research and talk to your doctor before deciding on a brand to use. A prenatal vitamin is just that—a vitamin. So the side effects are usually minimal. Some women experience a bit of nausea. Which can be helped by taking the vitamin with food or just before bed. Others have showed signs of constipation, usually helped by adding fiber to your diet. Constipation is usually due to the iron in a vitamin. If it persists, switch to a vitamin without iron and supplement with a liquid iron which doesn’t constipation. But most women have only seen positive side effects, helping with morning sickness during pregnancy and even shiny hair and longer nails! If you are having odd side effects after starting a prenatal regimen, speak with your health care provider right away. If you are trying for a baby, a prenatal vitamin is usually the first step on the road of motherhood. It’s the simplest thing you can do for your health. It will make your pregnancy easier and your baby as healthy as they can be. Your child may never thank you for adding this vitamin into your daily regimen, but you’ll be happy you did! If you’re already pregnant, see which vitamins you should be taking during pregnancy.